Tag Archive | "Archeological sites"
Loss of Culture: Can laws prevent the destruction of antiquities? only to fall to plague, pestilence or conquest. However, the lasting effects of these civilizations are the archaeological sites and artifacts left behind. Artifacts, like the Rosetta Stone, the Terra Cotta Army, and the David, and ancient ruins, like Machu Picchu, the Coliseum, and the Great Wall of China, give the world insight into how ancient civilizations lived, and contribute to the future development of the human race. Through the discovery and preservation of artifacts such as these, the human race can continue to preserve ancient cultures and ensure that they may help shape the future of humanity. Recent world events show a lack of regard for preserving these jewels of the past in the 21st century. For example, the world was recently shocked by Islamic State’s destruction of ancient artifacts and archaeological sites in Syria and Iraq. This is not unprecedented, however, as this type of destruction happens all over the world; not just in the Middle East, but in South America, and China, and is attributable to numerous causes, including urban development and war. The international community has attempted to ensure the integrity of the world’s cultural sites through the creation of the United Nations Educational, Scientific, and Cultural Organization and two international treaties: the Convention Concerning the Protection of the World Cultural and Natural Heritage and the Convention for the Protection of Cultural Property in the Event of Armed Conflict. The Convention Concerning the Protection of the World Culture and Natural Heritage, also knows the 1972 World Heritage Convention, created the World Heritage List allowing for archeological sites of “outstanding universal value” to be placed on a list that tries to keep the sites protected. For example, the Statute of Liberty, the Tower of London, and the city of Venice are just some of the sites on the World Heritage List. The World Heritage List also includes cites that are in danger, such as the Old City of Jerusalem and its Walls. Although these safe guards ensure archaeological sites and artifacts are recognized, and the conventions include sanctions which deter member States from breaching the conventions, it is the sovereign duty of each State to ensure that its archeological sites are protected. It is also the duty of each State to bring charges against parties that destroy or harm archaeological sites. In some cases, when a State does nothing to protect a site, or does not punish parties who destroy artifacts, the archeological artifact can be lost forever. Even though state parties to the above-mentioned treaties agree to protect their antiquities, the international community does not enforce its sanctions provisions against states who fail to protect. As of yet, no State has been brought before the International Court of Justice for a lack of protection. For example, China did little to protect artifacts when construction for an IKEA store unearthed an ancient tomb. Although China imposes a fine on companies who destroying ancient tombs, it does not enforce these law strongly, and as a result, an irreplaceable piece of history has been lost. The larger issue is that China was not brought before the ICJ for failure to protect in this case. The larger issue is that state sovereignty protects most state decisions regarding antiquities. Also, under the treaty, only a State Party may bring a suit against another State Party for violation of a treaty or convention provision. Thus, the principally affected shareholders, like the existing Mayan populations in Belize whose ancestor’s pyramids were destroyed, have no avenue by which to make the State answer for its lack of protection. In most cases, States are able to pressure principally affected stakeholders into forgoing a public fight, likely due to lack of enforcement by the international community. For example, the 1972 World Heritage Convention only asks Party States to “endeavor, in so far as possible” to protect the culture of the State. These archeological sites and artifacts are the backbone of ancient civilizations, and in essence are owned by the people of the State and the existing decedents of those civilizations. Yet, principally affected stakeholder have no recourse to stop the destruction. A model that States can follow to ensure preservation of archeological sites and artifacts is that of the United States. The United States strives to ensure the rights to cultural sites and artifacts are given to decedents of the creating civilization. The Native American Graves Protection and Repatriation Act of November 16, 1990 gives the right of ownership over human remains and sacred objects to Native American tribes, after certain requirements are met, such as showing a relationship of lineal descent. Likewise, the Archaeological Resources Protection Act of 1979 protects the archaeological sites and resources of Native American lands. If other States follow a similar model as that of the United States, then the archeological sites and artifacts have a better chance of survival. 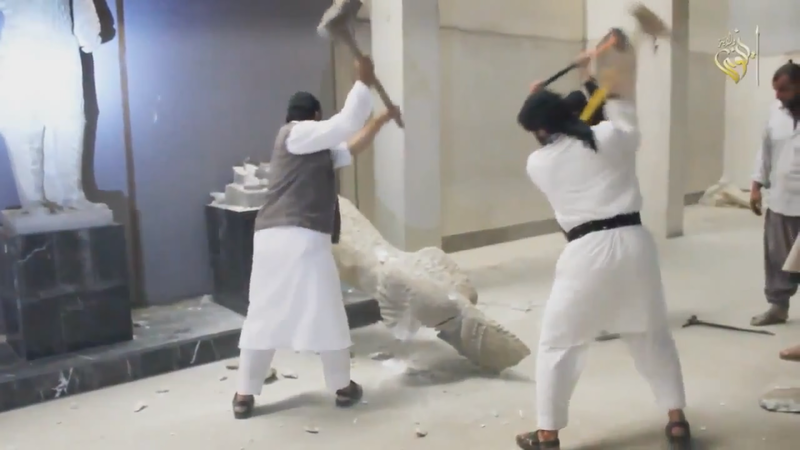 Even if a State does everything to try and curb the destruction of archeological sites and artifacts, once destruction has occurred, the history, the memory, the civilizations are lost forever. Teresa Milligan is a 2L law student at the University of Denver Sturm College of Law and is Editor in Chief for the Denver Journal of International Law and Policy.